Higher female literacy is a reliable predictor of lower fertility and improved prosperity. 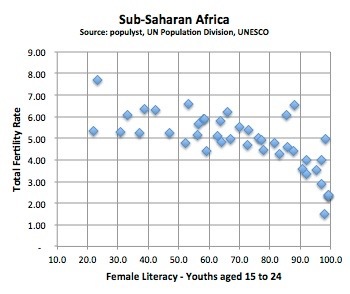 In a previous article, we highlighted a clear connection in sub-Saharan Africa between a country’s total fertility rate (TFR = average number of children per woman) and its young female literacy rate. The data showed that higher literacy may set off a chain reaction that results progressively in lower infant mortality, improved health for women, and lower fertility. While literacy rises to 90%, fertility falls gradually. Above 90%, it falls precipitously. End of the year exams in Mahatma Gandhi Seva Ashram, Jaura, India. © Yann Forget / Wikimedia Commons. In turn, this lower fertility can, under the right conditions, open a window of opportunity for the economy to realize a demographic dividend. Among the many unsung factors that contributed to the onset of the Chinese boom in the 1990s is the sustained campaign during the preceding decades to boost China’s literacy levels. Even before the one-child policy was enacted, China’s TFR had fallen precipitously from 6.38 in 1966 to 2.75 in 1979, according to the World Bank. Overall literacy grew from 65% in 1982 to 78% in 1990 to 91% in 2000 and 96% in 2015. In those same years, female literacy grew from 51% to 68% to 87% to 94%. Today, male and female literacy are very close at 99.7% and 99.6% for young Chinese aged 15-24. This is worth noting because in the poorest countries of the world, female literacy tends to lag male by double digits. Higher female literacy is a reliable predictor of improved prosperity. Examining this correlation for the various Indian states, we find that the relationship holds well. 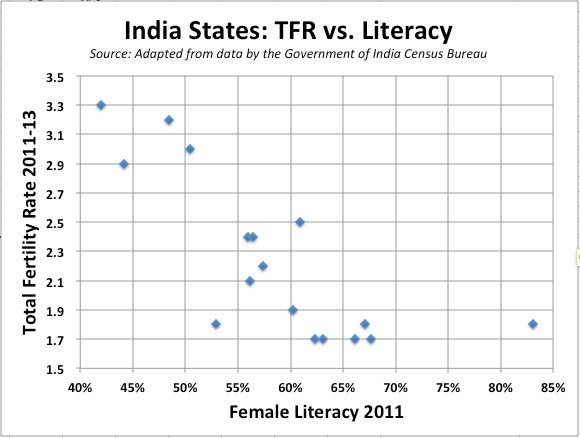 India’s overall TFR has fallen rapidly in recent decades and in several states, it now stands at below replacement levels. This has occurred while literacy has improved but has remained below 70% in all but one state, Kerala. 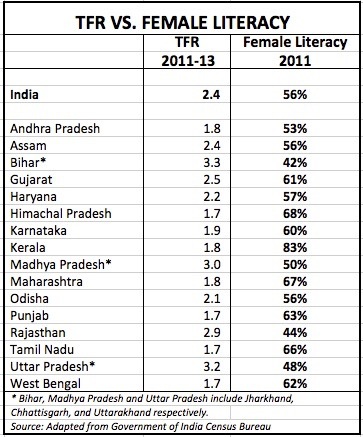 The table and chart show the TFR and level of female literacy for all the states. Nirav Shah compiled the data and assisted in the preparation of this article.